A Full-day advanced bicycle tour aiming to take visitors around lesser known temples of the Angkor complex. Tours will take you to hidden trails, jungle, and local village. -Local market: Beginning our trip with our signature style: A lovely ride through local Cambodian villages. This 15-minute ride takes visitors away from the luxurious hotels of Siem Reap city to the tiny routes littering local market. Get to know friendly villagers, and be sure to send out plenty of waves to the little children chasing our bikes! - Angkor Wat’s authentic view behind: Next, visitors will take a trail that leads to the behind Angkor Wat. This is a route that’s very few take, guaranteeing a peaceful and unobstructed view of this magnificent complex that holds great historical and religious significance to many Cambodians. - Ancient Stair of the Bakheng Temples: Next trip, visitors will tour round the foot of Bakheng Mountain. A guide will tell you about the significance of its ancient stairs in relation to Bakheng Temple construction, which is guarded by two fierce lions! 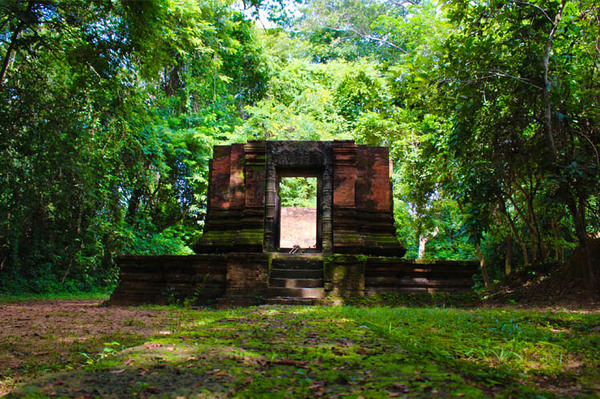 - Baksei Chamkrong Temples: Just a short distance away is Baksei Chamkrong, a small pyramid-shaped Hindu temple. Baksei Chamkrong, which means “a bird sheltering its wings,” has an interesting legend connected to it. Be sure to listen carefully to this story! - Death Gate: Death Gate.” Not as scary as it sounds, but rather, a very significant part of Angkor’s temple complex that kept out many enemies and intruders! 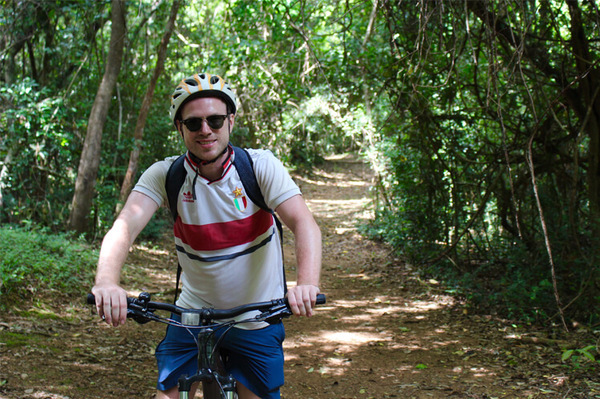 - The Jungle Trail to Ta Mei Temple: Walking along the quiet bicycle path! Getting to this riding, look outside for the finely carved structures and the temple covering by huge trees—a mythical significant to Hindu-Buddhist mythology. Stay near the relaxing shade and listen to the legendary story of the temple! - Lunch at Neak Pean Temples: Hungry? 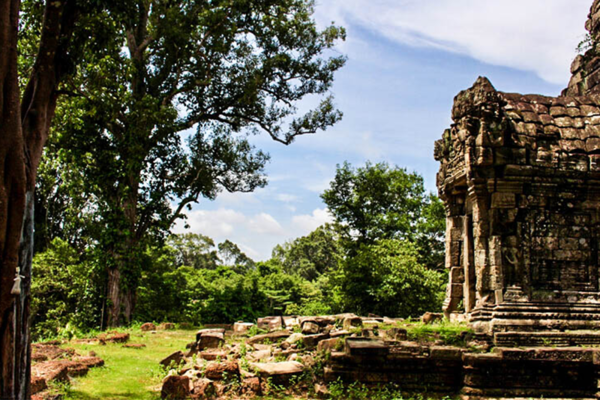 Visitors will go on a hidden trail behind Neak Pean Temple where you will then take a longer stop (30 minutes) to relax and enjoy a delicious local lunch! - Rice Paddy Trails: With tummies filled, next step will now embark on a trail that leads visitors across the vast landscape of rice paddies. You will make a few stops along this trail where you will be able to learn more about Cambodia’s traditional agriculture and even try out some paddy planting with local farmers—a sure way to make new friends! Our tour ends with an off-road ride back to our office. As to respect temple visit, please wear clothes that covers your shoulders and knees.